Baba was then a charming youth of seventeen years. Three years earlier, he had declared, "I am Sai Baba of Shirdi come again for the redemption of mankind!". In spite of the revealing declaration, many people around him in Puttaparthi were sceptical about his might and mission. One such person was Lakshmaiah, although he had a deep love for the divine boy. The Sai Pravesh (the advent of Sai) will transform that region into Prasanthi Pradesh (a region of highest peace). There will rise a bhavan (mansion)! Lakhs of people from all over India, why only India, from all over the world, will come and wait there for Sai darshan (sight of Sai)! You will have to believe it when you have to stand where we are now, trying to catch a glimpse of me, standing on the porch of that bhavan. 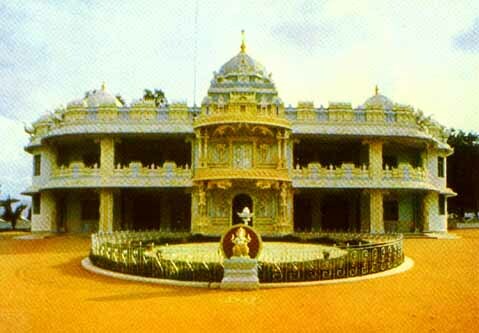 The bhavan (mansion) that Baba spoke of on that day is the mandir (temple) in Prasanthi Nilayam, the sacred abode of the Lord in the human form of Bhagawan Sri Sathya Sai Baba. This mandir is the heartthrob of millions of people all over the world. Sri Kasturi, the octogenarian biographer of Baba writes about the mandir, "It has been the scene of countless transformations of character, revolutions in belief, confirmations of faith, curing of disease, calmings of temper, discarding of hatred, salvaging of souls and reunions of hearts." Indeed, the mandir today stands as the symbol of the redemption of the world through the transformation of man. This mandir is the nucleus of Sai's mission of Dharmasthapana. The majestic mandir now stands facing north in a compound measuring 220' x 150' and its plinth area is a little more than 7500 square feet. It is a nilayam (residence) evolved into a mandir (temple). The construction of this building in the late forties may be described as the first manifestation of the engineering skill of Baba! Baba was then in his early twenties. It was felt that the old mandir in the village was too small to accommodate the growing Sai family that gathered round its young Master. A big building was the need of the hour, and it was raised with stone and mortar. 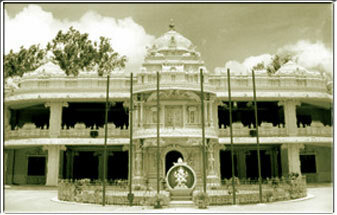 Bhagawan himself was the architect and engineer of this building, which he transformed into the mandir in 1974. Also, he was the accountant! Baba recollects even now with a merry twinkle in his eye how he was doing the batwada (weekly payments to labourers), getting the signatures of the lucky recipients on the vouchers. Others who were associated with the construction of the Nilayam are Sakamma (a devotee from the Coorg District in Karnataka, who was instrumental in the construction of the old mandir in the village); the Raja of Sandur (a province now in Karnataka); Tiruvenkatam, a merchant from Bangalore; and Thirumala Iyengar, an engineer in charge of the construction of the Tungabhadra dam. Some curious engineers who visited the construction site now and then accepted the ideas of Baba, because they found them to be better than their own. They discovered that Baba had a greater sense of perspective and a finer aesthetic vision than they had. The story of the construction of the building is a chain of miracles wrought by Bhagawan's grace. The most astounding was the transport of the huge girders for the central prayer hall from the railway station at Penukonda 16 miles away. Girders of 40 feet length had come from Trichinopoly (now Tiruchirapalli) to Penukonda by train. The road from Penukonda to Bukkapatnam was a district board road with a sandy stream at the seventh mile, and it passed through a few villages with delicately built houses(!) flanking the narrow road on either side with a few acutely angled curves. There was a track of three miles, from Bukkapatnam to Puttaparthi with a few dilapidated culverts and low-level causeways and a broad expanse of the sand of the river Chitravathi. Then there was the task of hoisting the heavy girders on the twenty-foot high walls. Therefore, the engineers gave up all hope of transporting the girders from Penukonda to Puttaparthi and placed before Baba some alternative proposals for roofing the prayer hall. But Baba did not relent. One fine morning, the Road Transport Officer of Anantapur district, who was a devotee of Baba, woke up to find a surprise in front of his house. It was a huge crane from the Tungabhadra Dam site, which had stopped there and refused to move forward. It had struck work! The driver was grappling with the engine in vain. He could not make it move. He sought the help of the Road Transport Officer, who thought that the crane was Baba-sent(!) for transporting the girders from Penukonda to Puttaparthi. It was agreed that the crane would transport the girders if it were repaired. The R.T.O. hurried to Puttaparthi and prayed to Baba, who materialised some vibhuti (sacred ash) and gave it to him. This vibhuti was smeared on the engine, and the driver was asked to start it, and --lo-- the crane started moving! The surprised driver went happily to Penukonda railway station, lifted the girders with the giant arms of the crane and started toward Puttaparthi. The sight of this giant carrying the girders was a great surprise for the villagers, who greeted it by lining up on the roadsides. The crane somehow passed over the culverts, negotiated hairpin bends, lurched over the slushe,s and puffed its way up the Karnatanagapalli hill! It did not move further, perhaps on seeing the broad sheet of sand of the Chitravathi River! Baba himself went to the crane, sat with the driver, and handled the steering wheel. Thrilled by the touch of the Lord, the crane moved happily to the work spot and unloaded the girders. Prasanthi Nilayam, the simple looking two-storied building of granite, was inaugurated on 23 November 1950, the twenty-fifth birthday of Baba. It had a central prayer hall flanked by rooms on either side and corridors in front and behind. In addition, there was a small portico attached to the central portion of the corridor in the front. The height of the prayer hall was divided into two floors for the rooms and the corridors linking the rooms on either side. The Nilayam continued in its original form with very few modifications until 1973, when Bhagawan Baba planned and executed the transformation of the residence into the temple. The building was extended on all sides and domes were built on top of the building. The exterior of the whole building, the corridor, and the portico on the front and the interior of the central prayer hall were covered with beautiful and meaningful pieces of sculpture of Indian tradition. These alterations and additions changed the very appearance of the building and gave the structure a very majestic and sacred appearance. All this was completed by 23 November 1974, the day on which Baba completed forty-eight years. On that day, Dr. V.K Gokak, who later went on to become the first Vice-Chancellor of Sri Sathya Sai Institute of Higher Learning, asked Bhagawan, "Swami, your first sixteen years were full of leelas (divine pranks), the second sixteen manifested mahimas (miracles), and at thirty two you started upades (teaching). Is there any novel feature marking the completion of forty-eight?" Baba said, "Look around!". There it was! Prasanthi Nilayam had become Prasanthi Mandir! The residence, which housed the young Sai, had become the temple with God installed in it. The three phases --leelas, mahimas, and upadesh-- were fused together in divine harmony to confer benediction by darshan (sight) alone. The Prasanthi Mandir is a living testimony to the life and message of Bhagawan Sri Sathya Sai Baba. The Mandir speaks eloquently the divine message of the unity of life, universal concord, and harmony through its sculptured angels, humans, and animals, feasting our eyes on the various faces of this aesthetic wonder. The peacocks and snakes, the elephants and lions nestling close to each other on the facade of the mandir in quiet ecstasy speak a meaningful message to those who have eyes to see, ears to hear, and hearts to feel. These sculptured beings on the facade beautifully bring out the drama of transformation and transcendence that can occur if one sincerely strives to sublimate oneself. The lions, elephants, snakes, and peacocks, contemptuously dismissed by us as sub-human species, have lifted themselves to a sublime stature by practising maitri (friendship), mudita (joy), karuna (compassion), and upeksha (detachment). The transformation of the human into the divine is demonstrated through the sculptures of pamara (ignorant one), deva (angel), and hamsa (swan). The pamara, by constant striving, becomes a devata (angel) and ultimately transforms themself into a Paramahamsa (a realised soul) by bringing into perfection the four noble virtues: maitri, mudita, karuna, and upeksha. The hamsa (swan) stationed above the elephants, lions, peacocks, and snakes climaxes the sculptural drama of divine transformation, for the hamsa signifies Paramahamsa (realised soul) itself. The facade, which is the face of the Mandir, expresses the very essence of Bhagavan's message. Another sculptural drama that the Mandir unfolds is the drama of the adoration of the divine. This sublime theme is unfolded through the sculptures of the sub-human and the angelic creation of God rapturously lost in the worship of the Lord. The sculptural figures on the darshan mantaps (shelters built for devotees adjacent to the compound and facing the Mandir), for instance, a pair of nandis (bullocks) looking lovingly at a Shivalinga (a symbol of Shiva), a pair of lions guarding the Dharma Chakra, the winged angels playing on the flute, trumpet, and cymbals in prayerful ecstasy write a rich commentary on this divine adoration. The elephants carrying garlands to revere the Sarva Dharma (Eternal Religion) Symbol, the divine images carved on the wooden doors of the central prayer hall and the interview roo, substantiate the same theme. The sculptures of a pair of swans gathering around a lotus, a pair of deer inhaling the fragrance of flowers, and a pair of peacocks gathered together teach us the valuable lessons of amity and co-existence. The profusion of sculptured flowers strewn all over the central Prayer Hall, on the ceiling, pillars, arches, doors, and windows, speak in their own language of silence; the flowering of the spirit as a consequence of devotion to the divine. The kingdoms of plant, bird, beast, and angel have been beautifully featured to substantiate the theme of adoration of the Lord. The central prayer hall is a thing of beauty, joy, and wonder. The five religious symbols descending from top to bottom of the walls on each side of the altar sing silently but sweetly the song of the unity of religions. The life-size portraits of Shirdi Sai Baba and Sathya Sai Baba glow with life and light, thanks to the Divine Painter who guided the skilled hands of the human painter. The portrait of Shirdi Baba, simple and austere, eyes melting with quiet compassion, speaks of the Brahmatatva of Bhagawan's former incarnation. The portrait of Sri Sathya Sai Baba, radiant, full, and bewitchingly beautiful, the eyes aglow with a merry twinkle, speaks of the Vishnutatva of the Avatar. At the end of the hall is the sculpture of Sri Krishna singing the Song Celestial (Bhagavad Gita) to the war-weary Arjuna against the background of the battle of Kurukshetra. It is significant that in the same hall Bhagawan Sri Sathya Sai Baba delivered a series of discourses on the Geeta, expounding the forgotten and latent meaning of this Divine Song to the life-weary people of the Kali age. During those times of the divine exposition of the Geeta, the sculptured Krishna and the living Sai Krishna seemed to become one, breathing melodies eternally new. Equally significant is the scene of the sculptured avatars adorning the walls of the hall, enacting the drama, of divine descent and divine grace for the uplift of mankind. It is significant that all these avatars have upraised hands in the abhaya pose, conferring benediction on all those who are pure at heart. The ceiling of the Prayer Hall is profusely strewn with sculptured flowers of all sizes. The splendid chandeliers hanging from beautiful lotuses make the building an impressive blend of the ancient and the modern. And most meaningful, of course, is the colour combination used inside and outside the entire Mandir. Blue, yellow, and pink are the colours used, communicating the message of the harmony of spirit, intellect, and heart respectively; for blue stands for spirit, yellow for intellect, and pink for heart (love). The rich harmony of the three does result in santhi (peace) and Prasanthi (supreme peace); and that really is the message of the Prasanthi mandir. Adjacent to the verandah of the prayer hall on the left side, are two rooms set apart for interviews, zealously guarded by Dwarapalakas carved on the wooden doors. On the first floor (above the ground floor) is a large portico, adorned with silver doors. For a long time Bhagawan used to give darshan every day from this portico. How longingly the people waited with bated breath for the silver doors to open and the Lord to give darshan! Now Baba gives darshan from this portico only once a year, in the early hours of Christmas Day, accepting the prayers and supplications of thousands of Christians who throng to him. During that occasion, the portico appears to fade away, leaving only Baba before us, who becomes one with the love, the longing and the devotion that these seekers of Truth lovingly nourish in their hearts and bring with them from the far off corners of the globe. Crowning the Mandir are three domes gazing at the blue infinity, a symbol of eternity. The first, the outermost one that leads into the compound, is the 'Gate of Darkness'. A person who crosses it leaves darkness, ignorance, and inertia behind. He has nourished the holy thought of coming to the Presence and the spirit of darkness and ignorance has fallen behind him. Those who are immersed in darkness, the thamasic, will not even have the curiosity to enter! Then there is a second gate, just where the garden around the Lotus Circle begins. There, one is attracted by the magnificence of the building, the electric lights, the coloured candelabras, the hanging flower pots, that is to say, the active and passionate aspect,s which appeal to individuals who are rajasic, active and passionate. Next, one comes to the very door of the Prayer Hall, 'Gate of wisdom', leading the sathwic (the pure and serene) to the Abode of Peace. In front of this circular patch used to be the statue of Lord Vighneswara seated in the Abhayahasta pose (hand upraised conferring blessings); and there, a few yards away, a beautiful arch, the top of it containing two winged angels carrying the Sarva Dharma (Eternal Symbol) symbol. The arch leads to the entrance gate of the gopuram. 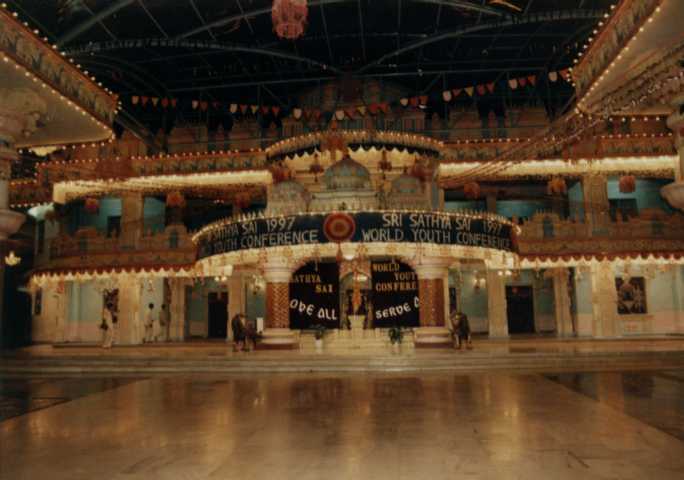 The circles and gates were removed in the mid 1990's, when the darshan area was immensely expanded to hold more devotees, given a marble floor and a beautifully appointed ceiling. Now, the mandir and darshan area together occupy a space of about 100 x 100 meters --about two American football fields placed side by side. If you dwell upon the significance of the gopuram, you can realise how holy, how mysterious, how revealing is its purpose. The gopuram beckons to wayfarers who have lost their way and who wander away from truth, 'O ye mortals! Blinded by the fog of physical attachments and self-aggrandizing urges, overcome by the miasma of worldly desires, which are fleeting and false, you have forgotten Me, the source and sustenance of you all. Look up to this eternal, ever pure, over-full tower of joy. Forgetting Me, you are wallowing in grief; you are pursuing the mirage in desert sands. Come, have faith in the Everlasting Me. Struggle out of the darkness and enter the realm of light, and come to the royal road of santhi (peace). That is the path of dharma. Come, come, O come!. Thus does Gopala call on all, with raised hand, from atop the gopuras in every village. This is the principle underlying the construction of Gopuras. Such high ideals inspire these structures.This is the true meaning, a meaning that can be experienced and felt. The light on top of the gopuram is the symbol of the Light that is the refuge of all; it is the representative of the unflickering inner lamp, lit at the self-same Flame; it is the Inner Illumination, gained by merging in Hari. In consonance with what Bhagawan Baba has said on the significance of the gopuram, the gopuram of Prasanthi Nilayam beckons to all of us to light our inner lamps to see and experience the Light of Lights, which Bhagawan Sri Sathya Sai Baba is. The genesis and the growth of the mandir is as unique as the Avatar, whose divine abode the Mandir is. In the hundreds of aeons that have passed, no temple was ever raised during the living years of the Avatar. The vanaras (monkeys) in the Tretha-yuga had the singular good fortune of building for Sri Rama a bridge across the waters of the Hindu Mahasagar spanning Bharat (India) and Sri Lanka. In this Kali age, the naras (humans) enjoyed the unique good fortune of building a temple for their dearest Lord Bhagawan Sri Sathya Sai Baba. The devotees carried brick, sand and stone and built this aesthetic wonder, for their own joy and for the pleasure of their own Loving Lord. The Prasanthi Mandir is indeed the Living Temple for the Living God.